Are you ready for Cardfight on Broadway? Announcing Cardfight! Vanguard G NEXT! This season will begin airing on October 2 of this year! The aim of this story arc follows TRY3’s members splitting into new teams to try and win the U20 Championship. A new OP and ED starting November 23! “Hello, Mr. Wonderland” by Nakanomori Fumiko will be the opening. “Wing of Image” by RUMMY LABYRINTH is the new ending. Some guy A new ally named Kazuma appears! He is a Shadow Paladin player. It appears he is tied to the new “Ritual” mechanic debuting in November. 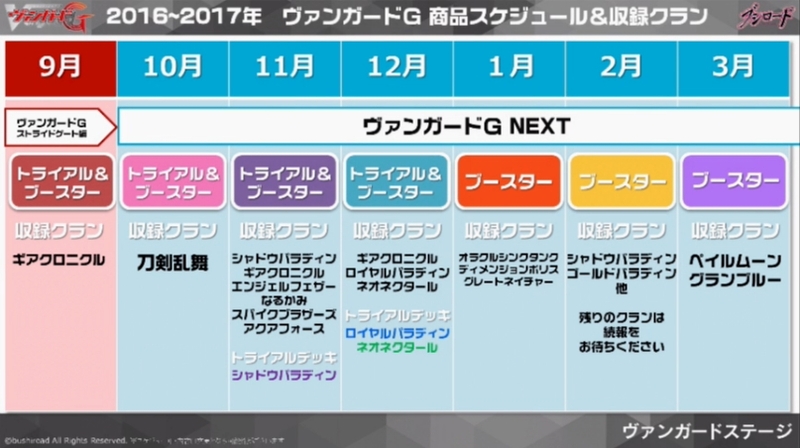 Shion and Tokoha also get new teams! Some other guy A mysterious new character! At the Bushiroad World Grand Prix 2016 there’s a “Fight Table G” Trial Event (tech provided by Sony). It seems to be the same Fight Table that was showcased in the VA duel earlier in the stream. It also mentions to check the official site for more details. A musical on air from a]April 1st to April 9th in AiiA 2.5 Theater Tokyo. It follows the -you guessed it- Link Joker Arc. Special thanks to our Ygorg Senpai, Eva for Translating along with our own Siulzen, Raphelencia from Pojo and Vere from Cardfight Wikia for assisting in information gathering. As well as NeoArkadia for Quality Control. Thank You everyone! Duelistgroundz staff. YGOrganization Affiliate. Cardfight Coalition staff. Terrible Duelist. "I'll take my crown to the grave and be an Underground King."